That’s what Aldridge said during the Blazers exit interviews. You can read into that what you wish. There have also been reports from unnamed teammates saying there’s a 50-50 chance he leaves, and the desired destination is back home in Texas. The San Antonio Spurs and Dallas Mavericks are said to be known suitors, which could be challenging for Portland to contend with. Specifically San Antonio. I could see Afflalo rejecting his player option and seeking a multi-year contract in a similar price range. I could also see Steve Blake doing the same and seeking a few more bucks in his pocket. And both of those losses are easily replaceable for Portland. I would not pick up Kaman’s team option for next season. Not because I don’t believe he’s an asset, but he’s a guy you can likely get later in free agency for a similar price and focus your cap space on pieces you desire. But of course for the Blazers to continue building what they have, they need to retain one of their franchise cornerstones in Aldridge. I love Aldridge as much as the next guy, but I am of the belief that he’s probably a ‘piece’ as oppose to a ‘centerpiece.’ But there’s nothing wrong with that. I tend to look at Damian Lillard in the same respect. We mentioned in an earlier post about players viewed as “number one” guys and “number two guys,” I don’t look at either guy as a number one, but closer to a two. They’re both excellent players. Somewhere in between a one and two, one-point-five, perhaps. You can still win with that. Especially two guys like that. You just need to surround them with a strong supporting cast and in particular, strong bench. Something this team has severely lacked the last two seasons. When the Blazers lost Wesley Matthews to a torn ACL this season it was a huge blow. He’s a heart and soul player, and the bench was already depleted as it is. It affected this team probably more than some even anticipated. Then you have a player like Nicolas Batum, who despite Aldridge and Lillard, may be every bit as important to this team simply because of everything he is capable of doing on the basketball court. But the one problem is, he’s incredibly inconsistent. Exploring a trade for Batum I don’t think is the worst thing. Maybe a call to the Denver Nuggets for a package of Wilson Chandler and Jusuf Nurkic. With Robin Lopez also being an unrestricted free agent for Portland, adding Nurkic could pay dividends. Though possibly the biggest issue with that trade is the fact that Batum only has one year left on his deal. Denver may be hard-pressed including their first-round pick of a year ago. If the Blazers do retain Aldridge and Wes Matthews, they will eat up most if not all of their cap space availability this season. That along with the 23rd pick in the draft should take up about every penny. Rondae Hollis-Jefferson or Justin Anderson would be two players they should target in the draft. Wing players that can play defense and knock down threes. 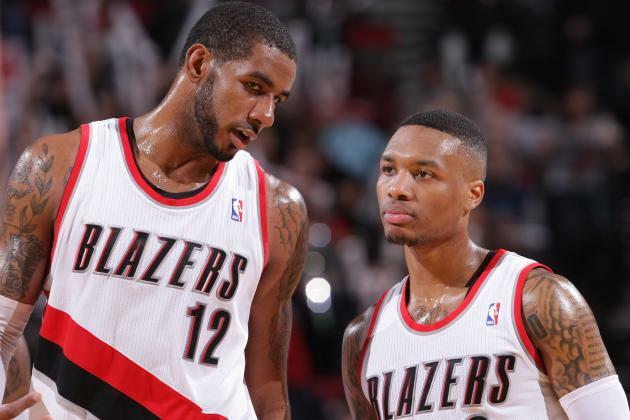 Portland may have to get creative with the bench if Aldridge comes back. Seeing C.J. McCollum really come alive the last three playoff games against Memphis could be huge going forward. Meyers Leonard needs to do the same thing. Thus far Leonard has essentially been a waste of a first-round pick. We need to see more of what he did in game four against Memphis, and it needs to be consistent. Leonard doesn’t have to become a sixth-man type guy, just a good rotational player that can provide a solid twenty minutes per night. If Portland can get what they did out of McCollum in the playoffs next season, and more consistency from Leonard, plus a wing defender who can shoot in the draft, it can go a long way to providing help for Aldridge and Lillard. Now if Aldridge decides to leave it’s a whole different ballgame. He would likely leave via sign-and-trade, so whatever they’d get back from say the Spurs, would hopefully be some sort of asset. But if he does in fact leave, I would target Paul Millsap in free agency because I don’t think the drop-off would be all that noticeable between he and Aldridge. Greg Monroe could be another target as well to fill the Aldridge void. And if they were to get Monroe, likely at a smaller price, then Khris Middleton could be an interesting target, though he is restricted. This would of course mean not bringing back Matthews. But if they don’t land these players at a reasonable price, I wouldn’t force the issue just to try and stay in contention. Building through the draft like they did with Aldridge, Brandon Roy, Batum and Lillard through the years is the way to go. They can add some pieces here-and-there in free agency. Especially with the cap number rising over the next few years and a premiere point guard already on the roster, it wouldn’t take long to build it back up.